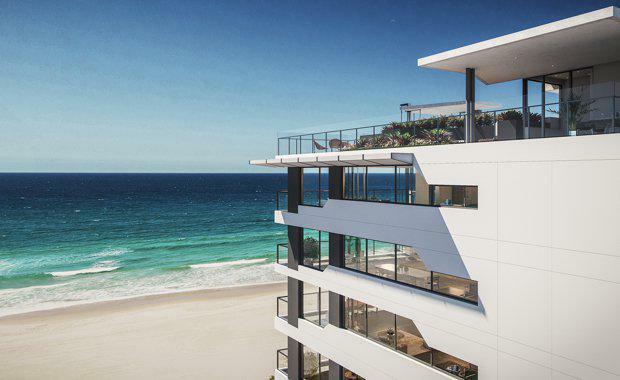 Developer Reed Property Group will this week unveil the final designs for its absolute beachfront $30m Astoria apartments, complete with six star finishes and larger floorplans featuring a central space which can be transformed into a bar, library or wine cellar. Astoria is located in one of Broadbeach’s rarest and most stunning beachfront locations and is within the 'dress circle' of the suburb surrounded by parklands, shops and restaurants. The development boasts a collection of just 16 half or full floor apartments with panoramic ocean views that can never be built out. Astoria's penthouse viewReed Property Group CEO Jay Emmerton says a recently amended development approval for Astoria has seen apartments increase in size from one and two bedrooms to the current two and four bedroom floorplans. "Astoria now boasts two and four bedroom apartments, each with two car spaces and additional storage, ranging up to 414sqm and priced from $1.3 million to $5 million plus," he said. Penthouse Floor One"We had a soft unveiling of Astoria at the start of the year which provided us with useful feedback from prospective purchasers. By interacting with prospective purchasers at an early stage we have had the opportunity to finish each apartment with the specifications that reflect the specific needs of our clientele. The end result is a limited collection of beautiful home-sized apartments that exude style, space and luxury. "For the four bedroom apartments, the real point of difference is the opportunity for purchasers to create their own 'centrepiece' by choosing a library, bar or wine cellar - which acts as a space to reflect their personality and lifestyle." 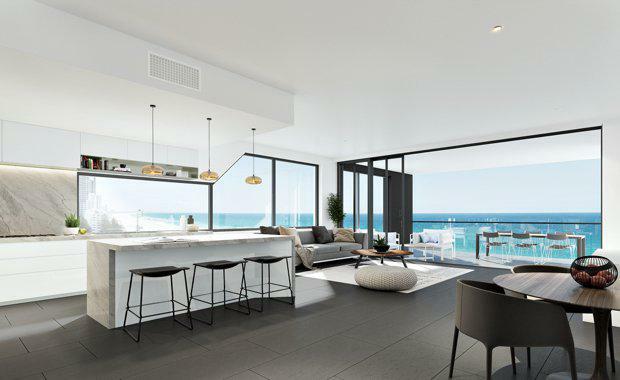 Penthouse floor twoAstoria has been designed by Arqus Design, with Project Architect Mitchell McGuire saying flexible floorplans are becoming a key drawcard for top end purchasers transitioning from a home to an apartment. He says each apartment includes a central space which can be transformed into a bar or library, or a full climate controlled wine cellar for an additional cost. Full floor apartments include a fourth bedroom which can be changed into a media or multi purpose room. "Astoria is a prime example of the trend towards collaborative design in high end, boutique apartment buildings which are aimed specifically at the residential market and are being tailored to the exact needs of end user," he said. For an additional fee, purchasers can upgrade to ultra-exclusive chef style V-zug and Sub Zero appliances, with a furniture package also available for those who want a simple and stylish solution for the finishing touches to their apartment. "I'm anticipating a lot of enquiry from locals who live on Hedges Avenue or in the canal estates who are ready to make the move to an apartment, but have been waiting for a property with right amount of space in the right place," he said. "The average house size in Australia is 162sqm, so Astoria's half floor two bedroom units are almost as big as the average home at 140sqm, while the full floor four bedroom apartments are actually bigger at 288sqm.